The Training Needs Analysis report published by ETF in April 2018 highlights that a focus on leadership and management, English, maths and digital skills is needed to take the FE profession forward with confidence through the current set of reforms. The report reflects the perspectives of over 400 institutions and more than 2,300 individual practitioners – including teachers, trainers, leaders and assessors. The research, which took place in Autumn 2017, also included 50 in-depth discussions with senior representatives of FE sector organisations. The purpose of the research was to provide intelligence that can support policy-makers and the sector in making informed investment decisions to support the workforce, to meet the challenges and opportunities that the technical education reforms, including T levels, will bring over the next three years. The independent and comprehensive analysis provides crucial baseline data to ensure future training for teachers and trainers is aligned with their professional needs and priorities. The resulting report provides the most significant analysis of the development and training needs of the workforce across the sector ever done and has been supported by all the key membership bodies and trade unions in the sector, as well as by the Department for Education itself. 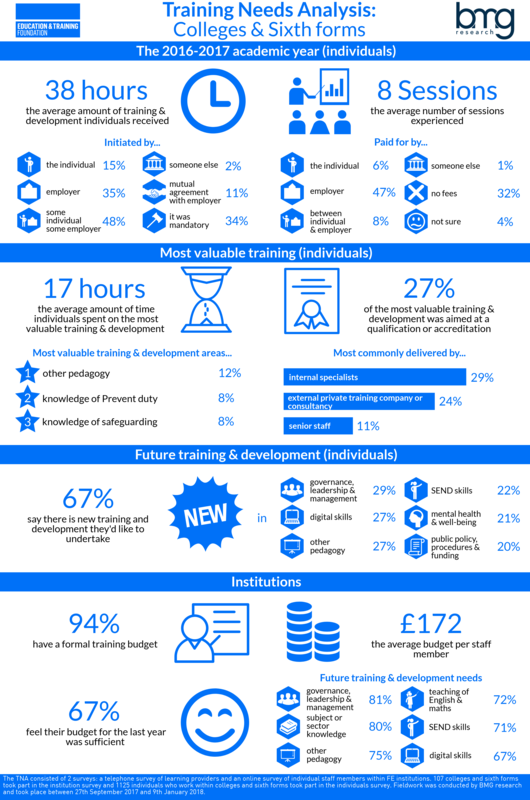 You can download a copy of the full Training Needs Analysis report here. You can find a handy summary of the 10 key findings of the report in the Appendix to the official press release on the ETF website here.